Dan Gilbert, Brian Hermelin and Josh Linkner are three Jewish entrepreneurs in Metro Detroit who have teamed up to invest some venture capital into companies in an effort to rebuild the City of Detroit. 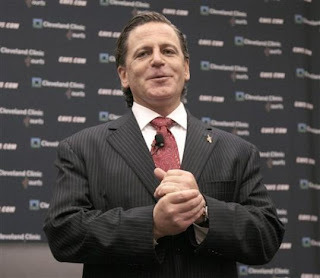 Gilbert is the founder and chairman of Quicken Loans, which is now headquartered in Downtown Detroit where he has been buying up business real estate properties in the city lately. Each of these three men has a great deal of experience in the business world. In addition to owning Quicken Loans, Gilbert (in photo) also is the majority owner of the NBA's Cleveland Cavaliers. Hermelin was CEO of Active Aero Group, an on-demand airplane charter company, and also founded Rockbridge Growth Equity with Gilbert. Hermelin's late father David, an insurance tycoon, was one of the owners of the Palace of Auburn Hills where the Detroit Pistons play, and also the Ambassador to Norway before his death in 2000. Linkner considers himself a serial entrepreneur having started a couple of companies before launching ePrize in 1999. Gilbert and Hermelin, along with other Detroit businessmen, invested $32 million into ePrize through Rockbridge in 2006. Now Gilbert, Hermelin and Linkner have created Detroit Venture Partners in an effort to infuse capital into businesses that are willing to help kickstart Gilbert's dream of a renaissance in the City of Detroit. What these three venture capitalists (who are all over 40, white and Jewish) seem to be missing is an African American businessman who is already beloved in Detroit and has a reputation for creating a financial renaissance in a predominantly African American neighborhood (think Harlem, NY). Enter Earvin "Magic" Johnson. The former NBA great tweeted to his Twitter followers last night that he'll be in Detroit to make a big announcement tomorrow. When I read Magic Johnson's tweet I started thinking about what this announcement would be. The Detroit Pistons have already been acquired by Tom Gores so I didn't think it was basketball related. And then this morning I awoke to an email from Josh Linkner (CEO of Detroit Venture Partners) announcing a "Magic" announcement. Linkner wrote, "Super exciting news for the City of Detroit, the tech community, and certainly myself personally. If you can, please watch it unfold live with streaming video at www.DetroitVenturePartners.com today, July 21, at 10:00am ET. It should be a powerful media conference announcing breaking news that I know you will enjoy." Quicken Loans founder and chairman Dan Gilbert has called a news conference to announce an addition to a venture capital company focused on rebuilding Detroit, and a tweet from ex-NBA star Magic Johnson suggests it's him. Gilbert's spokespeople say a sports legend and Hall-of-Famer will be introduced Thursday as the newest member of Detroit Venture Partners. They and Johnson's staff wouldn't confirm Wednesday that it's the former basketball player. But Johnson posted Twitter messages Wednesday night saying he'll "be making a big announcement in Detroit" on Thursday and looks forward to helping put "people back to work" in his home state of Michigan. The early-stage venture capital business focuses on entrepreneurship and technology to create jobs in Detroit. This is great news for Detroit. I dream that my children will have a vibrant downtown area in Detroit like my parents had before the riots in the late 1960s. Hopefully Magic Johnson will bring his magic to Detroit -- the same magic that won championships for the Los Angeles Lakers and helped turn Harlem around. Here's hoping it works. UPDATE: Josh Linkner introduced Magic Johnson at this morning's press conference. Johnson said he is making good on a promise he made to Mayor Dave Bing during his campaign for mayor of the City of Detroit by investing some of his millions into economic growth in the city. johnson choked back tears as he introduced Mayor Bing, a fellow Hall of Fame point guard. They should get together with the other Johnson who could really heat things up, the Microwave! 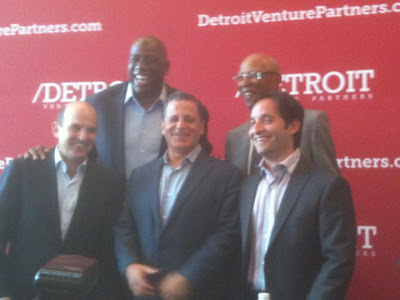 Vinnie has done so much quietly to save and create jobs in Detroit since retiring and built a nice little empire! Not bad for a kid from Brooklyn who calls the "D" his home! I agree with you Bubba. Vinnie has been great for Detroit. I just talked with him last month on the golf course. Great guy! 0:07!! !